This tactical thrusting dagger has a distinctive blade shape which allows for high strength and penetration. This is a strong personal defense blade. The blade is crafted from AUS-6 stainless steel, coated black, features G-10 handle scales, and includes an injection-molded nylon sheath with a clip. 2 1/2 in. blade, 5 3/4 in. overall. Sits well in its sheath, can take some weight and is as good of a push/cc knife as you'll get for the price. very sturdy blade,handle could use a more non slip grip, the sheath is a little cheap, had to add a snap to keep dagger in place , all and all a good self defense dagger, good for my nightly ninja late night jogging, i do like the service from Bud-K AND PROMPT DELIVERY SERVICE! Good Fit and Feel even for my large hand. Nice tanto style piercing point with double edge grind. All in all, good little personal protection neck knife, especially for the money! 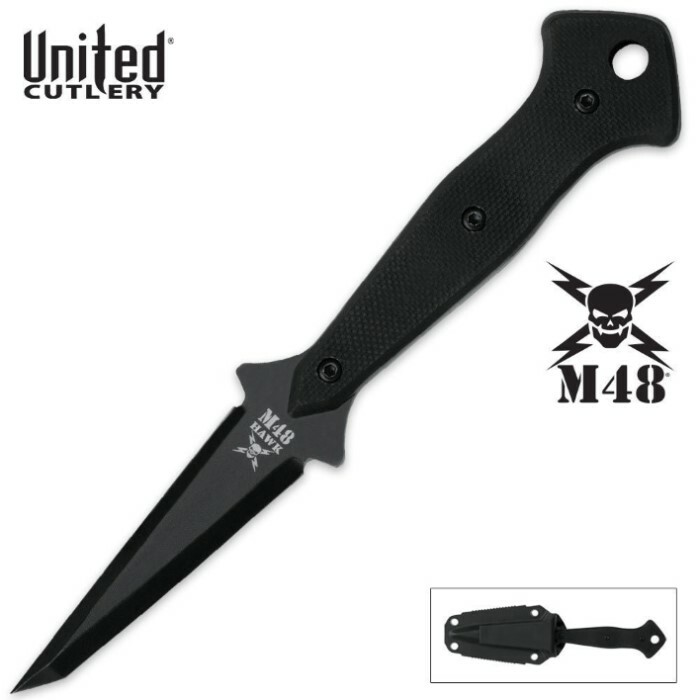 i love the shape of the blade because it is not a normal flat blade, a great defensive point for stabbing, the handle is a sturdy handle, it comes with a kydex holster but the knife does not fit into the snug.